IN THE MIDDLE OF EACH FLOWER IS A GENUINE PALE ISH CEYLON SAPPHIRE SURROUNDED BY THE VERY BEST REAL DIAMONDS. SOLID THICK HEAVY 18 CT YELLOW GOLD RING. THIS IS THE HIGHEST QUALITY RING. REALLLLLY GOOOD DOUBLE FLOWER RING. 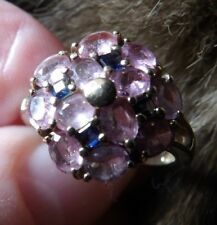 FOR YOUR CONSIDERATION IS THIS RATHER LOVELY 2 COLOUR SAPPHIRE RING. HAVING OVAL PINK SAPPHIRES & BLUE ACCENT SAPPHIRE STONES. WEIGHT IS 3.5G. Lovely Ladies Hot Pink Sapphire Dress Ring. 15 x 2.5mm round cut sapphire. Minimum total gem weight 1.207ct. Certificate of Authenticity available. Gemstone color : Pink Sapphire Cut : Very Good. Main stone : Pink Sapphire Style : Cocktail. Diamond Education. Secondary Stone : Diamond Main stone shape : Oval. And a large natural Brown sapphire (tested) 1.4 cm x 1 cm 8.22 CT cabochon cut. beautiful shoulders encrusted with sparkly white Topaz (tested). UK Size S US Size 9. weight 7.48 grams. IN THE MIDDLE IS A GENUINE PALE ISH CEYLON SAPPHIRE SURROUNDED BY THE VERY BEST REAL DIAMONDS. I THINK THE SAPPHIRE IS ABOUT A 20 POINT. SOLID THICK HEAVY CHUNKY 18 CT YELLOW GOLD RING. 8 DIAMONDS IN TOTAL. (Main stone: 2.60cts Natural cornflower blue, oval cut 7.20x5.40mm & 6.60x5mm, treated corundum filling, stone mined region Africa. ii) Where a piece of jewellery has been specially made for you. The item will be glossy polished & the claws will be cut & tightly set . Designed with a large oval sapphire cabochon to the centre. 12mm x 13.5mm. A stunning Sapphire and Diamond cluster or cocktail ring. Surrounding are many round brilliant cut diamonds. VVS - VS clarity. 1.39 ct Sapphire and 0.72 ct Diamond, 18ct Yellow Gold Five Stone Ring - Antique Circa 1910. It was made in England and the pictures are of the actual ring you are buying, and not just a scan from a catalogue. The heavy mount, weighing a huge 8 grams, is in excellent condition, with no wear to the setting or underbezel. Occasion :Anniversary/Wedding Total carat weight : 1.20 carat. Main stone : Sapphire Style : Cocktail. Total carat weight 0.33. Diamond Education. Ring Size Chart. Main stone Diamond. This ring is also available in 9ct, 14ct, 18ct yellow, white gold. Main stone: 0.40ct Natural yellow sapphire 5.24x4.35mm, oval cut, main stone origin Africa. The ring will be glossy polished & the claws will be cut & tightly set . Gemstone color : Purplish Pink Sapphire Cut : Very Good. Main stone : Pink Sapphire Style : Cocktail. Occasion :Anniversary/Wedding Total carat weight : 2.80 carat. The sapphires are beautifully cut, and a deep blue colour. It is set with diamonds in a flat oval setting on a 9ct yellow gold band. It is British made and to a very high standard. The ring is quite large at 12 mm x 17 mm, and sits flat to the hand. Sapphire And Diamond Designer Ring. Gemstone Type :Natural Sapphire. Total Carat : 1.00 Carat Ring Size : L. Hatton Garden Jewellery Quarter, London. DIAMOND JEWELLERY. Diamond Shape : Round Brilliant Setting Type : Claw Setting. Set with Madagascan White Sapphire in 9ct gold. 4.75g weight, 3.014ct. This ring is also available in 9ct, 14ct, 18ct yellow, white gold. 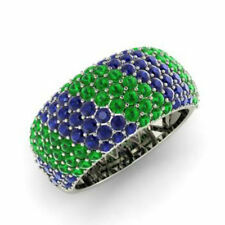 Main stone: 0.60ct Natural Bi-colour Blue green sapphire 5.13x4.15mm, oval cut, main stone origin Africa. The laboratory certification will certify to the gemstone's authenticity only. Gemstone color : Purplish Pink Cut : Very Good. Main stone : Pink Sapphire Style : Cocktail. Occasion :Anniversary/Wedding Total carat weight : 2.50 carat. 1.27 ct Pink Sapphire and 0.60 ct Diamond, 18 ct White Gold Dress Ring - Vintage. Occasion :Anniversary/Wedding Total carat weight : 1.00 carat. Main stone : Sapphire Style : Cocktail. Total carat weight 0.33. Diamond Education. Ring Size Chart. Main stone Diamond. Main stone : Sapphire Style : Coctail. Fancy diamonds colour Not applicable. Diamond Education. Secondary Stone : Diamond Main stone shape : Oval. Ring Size Chart. Main stone : Pink Sapphire Style : Cocktail. Occasion :Anniversary/Wedding Total carat weight : 1.25 carat. Total carat weight 0.33. Diamond Education. Secondary Stone : Diamond Main stone shape : Oval. Main stone : Sapphire Style : Cocktail. Diamond Education. Secondary Stone : Diamond Main stone shape : Oval. Ring Size Chart. Main stone Diamond. Gemstone color : Blue Cut : Very Good. Main stone: 5.15cts Natural Blue star sapphires, 9.80x7.95mm, main stone origin, Africa. Photos of the ring on the mannequin hand shouldnt be taken as an accurate representation of the ring on your hand. Main stone : Pink Sapphire Style : Cocktail. Diamond Education. Secondary Stone : Diamond Main stone shape : Oval. Gemstone color : Royal Pink Cut : Very Good. Birthstone: February,March,October, November. The laboratory certification will certify to the gemstone's authenticity only. This does not give a colour and clarity grade and will not provide an appraisal value. Occasion :Anniversary/Wedding Total carat weight : 0.75 carat. Main stone : Sapphire Style : Cocktail. Total carat weight 0.33. Diamond Education. Secondary Stone : Diamond Main stone shape : Oval. Occasion :Anniversary/Wedding Total carat weight : 2.40 carat. Main stone : Sapphire Style : Cocktail. Total carat weight 0.33. Diamond Education. Secondary Stone : Diamond Main stone shape : Oval. 9 SAPPHIRES- 2.20 CTW, ROUND & OVAL CUT, MIDNIGHT BLUE - black. HIGH QUALITY, 925 SOLID STERLING SILVER, 6 GRAMS, WIDTH-1.9 cm, HEIGHT- 7 mm. Main stone: 3.10ct Natural Blue ray star sapphires, 10.20x8.14mm, cabochon, ray star is visible under bright sunlight, bright artificial light, main stone origin Africa. The item will be glossy polished & the claws will be cut & tightly set . 2.99 ct Sapphire and 0.38 ct Diamond, 18Cara. Occasion :Anniversary/Wedding Total carat weight : 1.00 carat. Main stone : Sapphire Style : Cocktail. Total carat weight 0.33. Diamond Education. Secondary Stone : Diamond Main stone shape : Oval. 1.85cts Natural blue ray star, blue sapphire 925 Silver ring 7 or N1/2 or resize for £5 only. Main stone: 1.85cts Natural blue ray star sapphire, cabochon cut 6.85x6.85mm, stone mined region Africa. The item will be glossy polished & the claws will be cut & tightly set . Other stones: 13pcs natural paraiba blue zircons. This ring is also available in 9ct, 14ct, 18ct yellow, white gold. Main stone: 1.75cts Natural Yellow Sapphire Pear cut 8.10x6.50mm, pear cut, SI1, golden yellow, stone mined region Africa. 11cts Natural Black ray star sapphire 925 Silver floral ring 7 or N1/2 or resize for £5 only. Main stone: Natural 11cts Natural Black ray star sapphire, cabochon cut 13x11mm, Africa. The item will be glossy polished & the claws will be cut & tightly set . Natural Center Oval Cut Greysih Blue Sapphire: 17.90cts. Natural Side Round Cut White Diamonds: 1.10cts. Ring Size: 6.5. Can This Ring Be Sized: (YES). Total # Of Stones: 24 Cut: Round. The sapphire benefits from a deep Royal Blue colour, the most sort after in blue sapphire, and exceptional clarity for a 100% natural stone. A beautiful white gold, Diamond, and Sapphire cocktail ring. 6.80 ct Sapphire and 0.32 ct Diamond, Platinum Dress Ring - Antique Circa 1930. 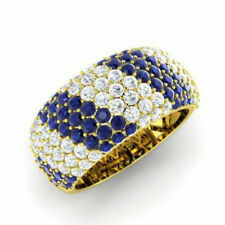 0.59 ct Sapphire and 0.45 ct Diamond, 18 ct Yellow Gold Dress Ring - Antique. Main stone: Natural 2.30ct Sapphire Blue Ray Star, cabochon 8.40x7.50m, stone mined region South Africa. Photos of the ring on the mannequin hand shouldn't be taken as an accurate representation of the ring on your hand.